This Event has been read: 692 times. I always say everyday above ground is reason to drink great wine and when I heard that the winemaker from one of California’s best producers of Chardonnay and Pinot Noir was coming to South Florida, I put a date on the calendar to break bread with Chantal Forthun. 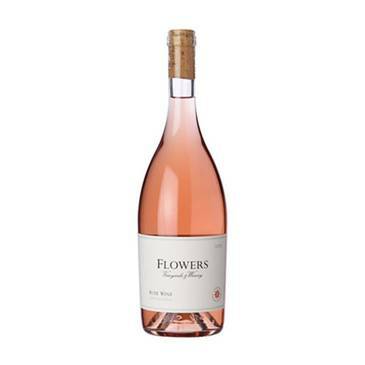 Flowers winery was started by Walt and Joan Flowers and they sought out the best terroir in northern California for these two Burgundian varietals and this lead them out to the Fort Ross Sea View AVA which is as close to the Pacific Ocean as you can grow grapes. This extreme growing region is one of the coldest in California and this allows them to make more Burgundian style wines which makes their wines unique and although this style may not appeal to all of those that like the big and fruit forward style of California Pinot Noir and Chardonnay it is a great bridge to Burgundy lovers that want to experience the best that the golden state as to offer. Join us as we welcome winemaker Chantal Forthun to South Florida for a special tasting of Flowers Winery’s current releases along with a special menu prepared by chef Toni Lampasone. The fee for this tasting which included dinner is $95 + tax, for reservations call 954-523-9463 or e-mail andy@winewatch.com. The fee3 for this tasting is $95 + tax, for reservations call 954-523-9463 or e-mail andy@winewatch.com. As nursery owners in Bucks County, Pennsylvania, Walt and Joan Flowers had long dreamed of combining their love of wine with their passion for agriculture. They knew they wanted to produce their favorite varietals, Chardonnay and Pinot Noir; what they didn't know was that their path would eventually lead them across country to Northern California's rugged Sonoma Coast. After responding to a small classified ad in a national wine publication, that's exactly where they landed. It is serendipitous that Walt Flowers ended up in the nursery business, given his surname. After completing his military service, Walt went to work for Moon Nursery in Bucks County Pennsylvania. The nursery had a rich history dating back to the mid-1700's when the Moon family received a land grant and sold their first tree in 1767. Generations of the Moon family worked in the thriving business, then the 1920's brought hard times to the nursery - a devastating Japanese beetle infestation, the death of J. Edward Moon and the stock market crash of 1929. By 1936, the William H. Moon Company was bankrupt. Real estate development claimed most of the nursery land. Hiram Rickert purchased what was left and continued to operate a small wholesale nursery and landscape company. In the late 1960's, the remaining ground was sold to a builder and Walt Flowers bought the Moon name to start the nursery again. When Walt and Joan married in 1982, they joined forces to build the new MOON, a state-of-the-art wholesale nursery, to over 1000 acres in Bucks County, PA and Chesapeake City, MD. The business required biannual trips to Oregon and California. During these intensive trips, the Flowers carved out time for rest & relaxation and to pursue their interest in wine. It wasn't long before they had a dream of owning a vineyard and winery, realizing they could apply their knowledge and love of farming to California grape growing. It wasn't until 1989, when Walt and Joan came across a small, three line classified ad for land on the Northern Sonoma Coast that their dream became a reality. Since their first visit to the property, the Flowers have maintained their belief that this tiny viticultural area could produce Chardonnay and Pinot Noir of the highest quality. The rugged 321 acre property situated less than two miles from the Pacific Ocean included a ridge top at elevations ranging from 1150' - 1400'. Expecting the same foggy weather they had experienced along the coast, the Flowers were excited to discover abundant sunshine on the ridge. However, the overall temperature was still relatively cool due to the property's proximity to the ocean, the cool morning fog below 1000' and the afternoon sea breezes coming over the ridge. It did not take Walt and Joan long to see that they were standing on a "warm site in a cool climate," the ideal growing conditions for Chardonnay and Pinot Noir. They purchased the property in 1990 and by 1991 had planted 23 acres on the narrow ridge, long known as Camp Meeting Ridge. 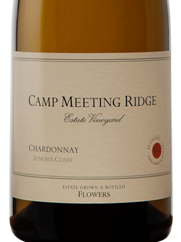 Camp Meeting Ridge represents the heart and soul of Flowers Vineyard & Winery. Since that initial planting of the old Wente clone from the Hyde Vineyard, the estate vineyard has grown to a total of 33 acres of Chardonnay and Pinot Noir planted on the high, narrow ridge running parallel to the nearby coastline. In June 1997, construction of a gravity-flow winery specifically designed for Chardonnay and Pinot Noir production was completed. Just when the Flowers thought their vineyard and winery were complete, a neighbor presented them with an opportunity to purchase an additional 327 acres. Like Camp Meeting Ridge, the rugged property was less than two miles from the Pacific but it had two ridges at elevations ranging from 1400' - 1875'. Flowers Ranch, as everyone soon called the property, was also a warm site in a cool climate. Forty-seven acres of Pinot Noir vines were planted from 1998 - 2001. In 2004, two distinct vineyards were recognized as part of Flowers Ranch, the 25 acre Frances Thompson Vineyard and the 22 acre Sea View Ridge Vineyard. Winery expansion to handle the additional fruit started in 2003 and was finished in time for the 2004 harvest. 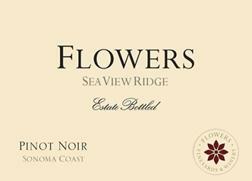 Today Flowers Vineyard & Winery represents one of three bonded wineries in the northern Sonoma Coast. The geographical area in which it is located represents less than 1% of the Sonoma Coast AVA. The immeasurable quality of this tiny region's fruit, however, far exceeds its size. 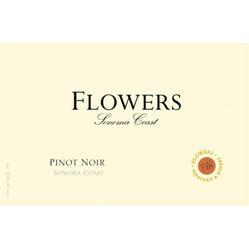 Today, Flowers Winery produces 15,000 cases of Chardonnay and Pinot Noir from its two estate properties, Camp Meeting Ridge and Flowers Ranch, as well as select vineyards in the coolest regions of the Sonoma Coast AVA, which are farmed to Flowers' specifications by their own crews. In addition to direct consumer sales, the wines are sold to fine restaurants and retailers in the US and overseas. 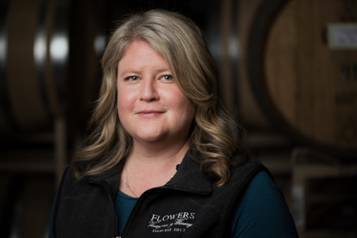 A large equity stake in the winery was recently sold to Huneeus Vintners, marking a new chapter in the Flowers story. The reason for this was simply that Walt and Joan are getting older, and their only heir (a daughter of Walt's by a previous marriage) isn't interested in taking over the winery. They wanted a partner, and so went looking for someone to come in and make sure that the winery would continue to thrive without a strict dependence on them. After a long courtship they selected Huneeus, who owns several wineries around the world, perhaps most notably Quintessa in Napa. The folks at Flowers indicate that basically nothing has changed there since the acquisition, which took place in January of 2010, and that not much probably will change for quite some time. At least for now, Huneeus is interested in making sure Flowers does what it has always done: turn out great wine.